Here you will get some Bengali romantic poems. All poems are very nice and good. These Bengali romantic poems you can share with your lover. Every lover wants tome romantic moment. So if you send these Bengali romantic poems to your girlfriend, then she will be happy surly. All poems are collected from different sources and some collected from the book. 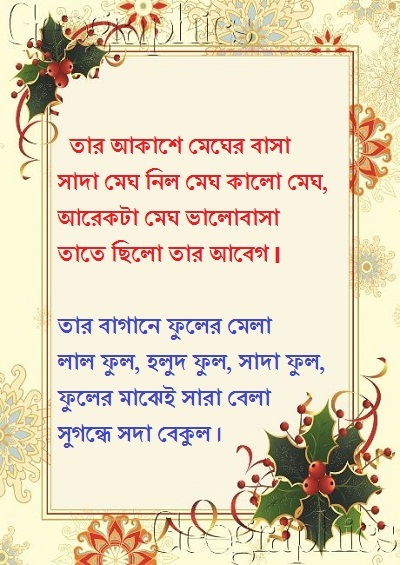 In the Bengali romantic poems you can select the best poems for your wife or girlfriend. Sarakhhon prio jon dekhte chay du noyon. bujina to ashole ki karon ..
tomar majei suphechi a Jibon..
Valobashar sagoree, Bose achi eka. Moner manush ashbe bole, Mon rekechi fhaka. Ridoyer gohiin bone, Tar chobi akaa. Kopale kii ache likha. Pabo kii tar dekha..
tumi amar ashar Aalo, Adhar rateer batii..
tumi amar sunno jiiboner ek matro Sathi. tumi amar chaoa-paoa, tumii e shokol Sukh. Tomaiy pele dhonnoo Hobo, jhurabe ei bukk..! Valo lage raat, jodi thake chad. valo lagena din, shongo bihiin. vaalo lagee shagorer dheu , jodii pashe thake kew. vaalo lage bristy jhodi rakho dristy.